So many social networks passwords to remember, so we are likely to confuse one with another. If you have set up a profile on your iPhone, you will need to go into your iPhone’s settings, go to General, and then tap on “Profile”. Remove the profile, otherwise iTunes forces encrypted backups every time you sync your iPhone with iTunes. That’s the reason why so many people say iTunes keeps asking for a password even they are 100% positive not ever set one. Is It Possible to Unlock Phone Backup Password? If you encrypt an iPhone backup in iTunes and then forget your password, you can continue to do backups and use the device because you do not need to enter the password for your backup each time you back up or sync. However you will not be able to restore the encrypted backup to any device without the password. So find the password is urgently needed to iPhone restoration from iTunes backup. This iPhone Backup Password Recovery is the very tool to find the iPhone backup password for you. It is easy-to-use and user-friendly. You don’t need to read a long manual and try many times before you figure out how to use it. Just follow the given steps (seen as below) and the prompt in the interface can you make it. How to Operate the iPhone Backup Password Recovery? Step 1: Import iPhone backup file – The tool will detect the destination file folder automatically. If it failed to detect automatically, find it manually. If you have no idea of the iTunes backup location, here is an article which gives the specific information. 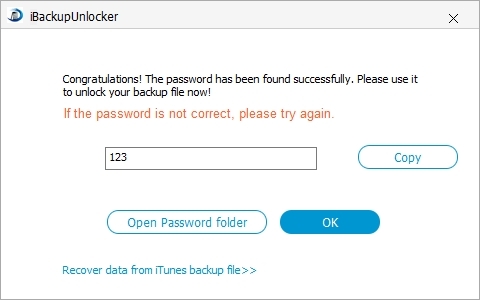 Step 2: Choose a proper attack type – The article Forgot iTunes Backup Password gives a detailed description of each attack. Step 3: Start to unlock iPhone backup password – when done, the password will display in the File Opening Password box. Hopefully with the pressure off a bit you will stumble upon the pass phrase that was used.